Matthew Morrell, Director General of International Rice Research Institute (IRRI), Philippines on Saturday expressed concern over a decreasing agriculture workforce, increasing population, climate change and the need for capacity building. 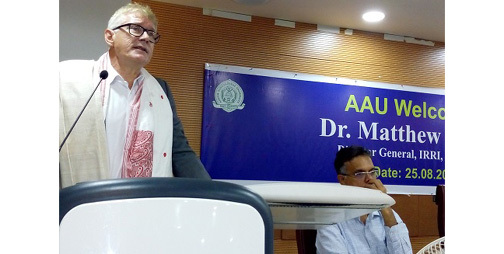 Morrel, while addressing a host of scientists at the Assam Agricultural University here on Saturday, said that the challenges to meet the world food requirement in 2040 which meant a 25 pc increase in production from the present were a great many, the biggest one being a likely reduction of 50 pc less people working in agriculture. Morrell is in Assam on a week-long visit in regard to implementation of the World Bank funded APART (Assam Agribusiness and Rural Transformation Project. He also said that in keeping with changing times, there had also been a change in research of the leading rice research institute in the world. Innovation, catalyzes and change in the lives of the farmers were three watchwords on which IRRI research was now based, he said. Regarding innovation, Morrell said that discovering genes to help in combating climate stresses, new methods of growing rice, growing nutrition fortified rice varieties were some of the innovations, IRRI was working on. Later he mentioned the Golden rice, a transgenic variety, and fortified with vitamin A, produced by IRRI which would be released in Bangladesh, US, Australia after the regulatory process was over. “We cannot rest till so many children are suffering from malnutrition,” he said. Regarding transmission, Morrell said that the reach to land impact was important in order to reach the people who need it. Morrell stressed that research should be so aimed that the benefits devolve to the farmers and make a clear difference to their lives. “If a farmer invests he should know that there is a potential of good returns which will aid him to educate his children and fulfil his dreams and life’s ambition,” he said. In this regard, he said that youths would be attracted to agriculture only if the returns were high. In response to Assam Agricultural University Vice Chancellor’s proposal that apart from collaborating in research whether AAU could collaborate with IRRI in academics, the students working in rice being able to complete the research part of their studies in IRRI, Morrell said that as both were into teaching and research, something could be worked out. Morrell further said that IRRI’s strategy to work with partners to reach where it mattered had worked but now they were decentralized their activities to India, Africa and some other countries. Hr also spoke on how farmers could be advantaged if they worked together in farming and forming enterprises. The advantage of involving women in agriculture. He referred to the value chains like cropping systems. During the Boro season, the shorter duration rice varieties were on the anvil, a Ranjit variety of 135 days would soon be released, he said. He also spoke of production which would yield more. US Singh, director, South Asian Research Centre informed that two flood resistant rice varieties produced by AAU in collaboration with IRRI, Ranjit Sub 1 and Bahadur Sub 1 would soon be launched in Nepal. 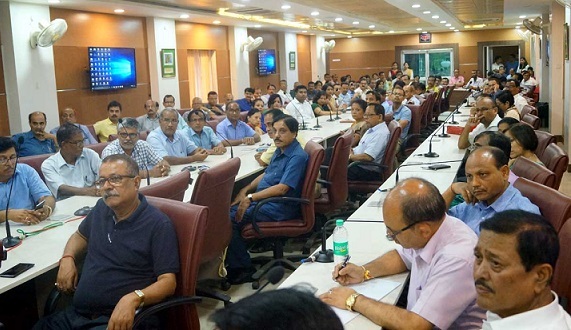 AAU VC Bujarbaruah said that out of the net sown area of 20.11 million hectare in Assam, rice was sown on 24.5 lakh hectare and the amount of rice produced was 5.2 million tonnes which could be increased to 12 million tonnes. “If rice production was increased from the 6 million tonnes to 10 million tonnes, then Assam could contribute to the National food basket or to the nearby states,” said Bujarbaruah. Bujarbaruah spoke about the ongoing research being done at AAU’s three rice research stations, North Lakhimpur, Karimganj and Titabar. He said that till now, AAU had produced 55 different rice varieties and 60 per cent rice cultivated in Assam were of these varieties. Bujarbaruah stressed on biotechnology making a difference in climate resilient varieties. Regarding drought resistant variety he said that Australia had got the best drought resistant gene from wild rice races and sought that they could collaborate with Australia in this sphere. “Australia now holds the key to world rice given the ongoing climate changes,” he said. IRRI provides technical guidance on improving rice production systems and management practices by promoting climate resilient technologies, encouraging their adoption on-field, and facilitating market linkages.